You might have seen the news – in the Laguna Seca preview – that Marc Goossens is joining Milka Duno in Monterey this weekend, in the CITGO Racing by SAMAX Riley Pontiac. The tall Belgian will race at three events in total during the balance of this season, with GM’s Olivier Beretta racing with the extrovert Ms. Duno in the remainder. The team also has a new engineer: Steve Challis, a Champ Car engineer for the past 10 years. Ironically, he’s worked with Dario Franchitti in the past. Dario’s bother Marino is the man who has vacated the seat of the Riley: he’s been fighting against an old(er) chassis (the Robinson Racing example) and a series of engineers (four already), but has performed flawlessly since the start of the season (at Mexico, below). 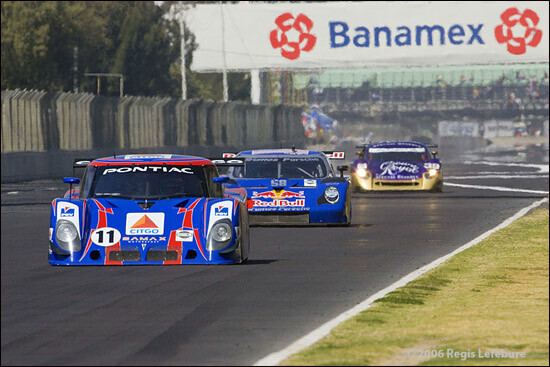 His connection with Milka Duno dates back to the Rolex 24 in 2005, a race that saw the Franchittis and Dan Wheldon well up in the top six – until Duno crashed the CITGO Crawford at dawn. “The competition is extremely fierce and I am extremely anxious to help my new team, beginning at Phoenix!” says Olivier Beretta. But first of all it’s Marc Goossens’ chance – to try and emulate the feats of Andy Wallace, who produced some extraordinary drives in the Milka Duno (Crawford) car in 2004 and 2005 – famously winning at Homestead in late 2004, after driving for 2 hours and 17 minutes, in conditions of very high humidity, in a very hot Crawford. This was the pair’s second win at Homestead that year – Wallace having watched two of GM’s factory drivers (?) fight their own war in the second race of the year. Both lost, Wallace won. In reality, anything other than a pro-pro combination will find it all but impossible to secure a podium finish in the Rolex Series this year, but wherever the CITGO Riley happens to be at the first caution, you can be sure that Goossens or Beretta will do their utmost to haul it up the field. "We have been working really hard to make our team and car as strong as possible,” said Milka Duno (left, with Sylvia Proudfoot), “and I would like to thank Marino Franchitti for his valuable contribution this season. The addition of factory drivers and a top engineer proves that we are on the right track. The series has become so competitive that it is critical to get as much help as possible to get to the front, which we will be making every effort to do." “At the front” / “get to the front” – we’ll see what Laguna Seca has in store for the #11 Riley. Almost every component of the team has now been changed. Milka Duno is currently featured in Pontiac's largest ever Spanish language advertising campaign.